When you first have your kitchen cabinets installed you are in awe, they look so new, clean, and sparkly. New kitchen cabinets quickly become your beautiful and convenient friend, they are nice to look at and also provide ample storage space. All of the use your cabinets receive on a daily basis can start to take a toll. The last thing you want is for your cabinets to lose their like-new appearance, after all kitchen cabinets can be a hefty investment and you want to get the most out of them. Here we provide 7 tips for keeping your kitchen cabinets looking great over the long haul, no matter how much you use them! It’s recommended you wipe down all kitchen cabinets and knobs once every 3 days. If you clean your kitchen sometimes it’s going to be a lot more work for you every time you get down to business. Largely because surface stains have had the opportunity to harden and solidify with time. 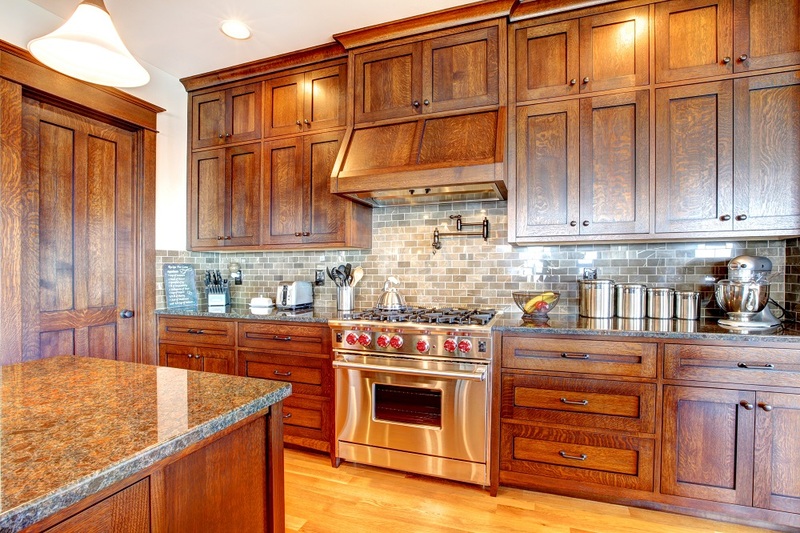 By regularly cleaning your kitchen cabinets you can prevent a build up of stubborn stains that lead to discoloration. Chemical cleaners can be full of abrasive ingredients that actually strip away at your kitchen cabinets. If you scrub hard enough and catch stains when they happen, you wont need a harsh chemical cleaner to take care of the task. Any cleaning products that contain ammonia will damage your wood finish and prematurely age your cabinets. If you do need harsher chemicals to clean off door handles or cabinet knobs, spray onto a rag and then carefully apply over knobs so that chemicals do not come in contact with the wood surface at all. Make sure that all of your cabinet doors and drawers close properly! If they don’t close all of the way, dust and dirt will freely float on in and build up inside of your cabinets, after a while this can create an unsightly, unsanitary and hard to clean mess. Plus, if you have any critters roaming your home, from unwanted bugs to curious house cats, open cabinets invite everyone inside. You want to keep moisture away from your cabinets as much as possible; for example, hanging a wet rag from a wooden cabinet is a huge no-no. You might know that wood and water don’t mix, but sometimes we take the durability of our kitchen cabinets for granted. No matter how many coats of paint or primer a cabinet has, the wood will still wear away and rot if it is continually exposed to water (Read More). Since tough, harsh chemicals are discouraged when it comes to cleaning your kitchen cabinets, try using a natural cleaner that produces the same sparkling clean results. Simply mix vinegar, water, and a dash of olive oil together for the perfect kitchen cabinet cleaning solution. The vinegar battles bacteria, and fights away built up grime, while the olive oil leaves behind a glossy shine. You can finish off your ritual by applying a wood finish for an extra coat of protection; just check reviews and ingredients because certain products create a sticky build up you want to avoid. 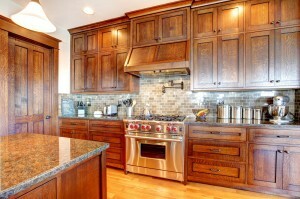 While you should clean your cabinets regularly, you only need to add wood polish once every 6 months or so. There might be a ‘no door slamming’ policy in place at your house, but can you say the same about your cabinets? Often we don’t even notice when we slam cabinets closed because they don’t make a very loud sound, but over time this breaks the cabinet down unnecessarily. It can also lead to dings and chips on the inside lip of your cabinet. By adding hardware, such as cabinet door handles, you can actually deter people from opening and closing cabinets with such force. Some prefer to layer their cabinets in a new coat of wax once every 6 months; this provides a protective barrier so that oils, steam, and other debris can’t build up on cabinets and cause permanent discoloration or dulling of the paint. Any wood furniture wax that meets your standards of quality should do the trick. 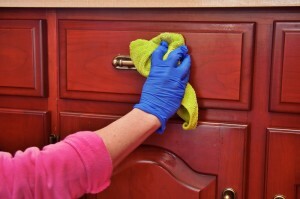 For even distribution, spray wax onto a cleaning rag and then apply over the surface of your kitchen cabinets. With a little love and care you can keep your kitchen cabinets looking new for many years to come!